Paddle Wheeler 2- and 4-seat commercial fiberglass pedal boats are made to be played on, not worked on. Paddle Wheelers are now available with aluminum pontoons on the 4-seat model. DMM Industries also offers an ADA-accessible paddle boat. Give visitors to your park sturdy, safe footing on boat docks, swim platforms and various walkways with Connect-A-Dock. Its five-minute (per module) attachment system means easy installation, and the strong polyethylene construction ensures many years of dependable service. It is so versatile, you can use the Connect-A-Dock system modules wherever safe footing is required—even on land. Connect-A-Dock is ideally designed for today's user-friendly facility. Not just fast and easy to install, Connect-A-Dock is versatile—modules can be configured end to end or side to side, as long and wide as you wish, for many different applications or configurations. Water Ventures' new itBike is the new generation of pedal boats. itBike is a light, human-powered water bike that features a high-performance prop-based biking system mounted on top of a world-class glass fiber body. The combination of design, lightness and the prop-based transmission enables itBike to travel two to three times faster than conventional pedal boats. The itBike hull is made of a high-tech composite glass fiber cover, and inside the hull is a closed-cell foam core that does not allow any water to penetrate the itBike. The patent-pending Insert Module includes the lightweight aluminum bike system and an integrated fiberglass keel that clips into the hull in 60 seconds. Shower Tower, the only outdoor shower constructed of a high-grade polymer/plastic designed for beach, volleyball, park and resort/pool use. Shower Tower's vandal-resistant design includes the column, which will never rust or need painting; self-closing push-button control valves; and severe service, stainless and chrome-plated brass fixtures and hardware. Each tower can provide up to six user stations arranged in any combination of shower heads and foot-wash nozzles. Serves many in a small space. Easy to install and maintain, the Shower Tower features a handsome design available in a variety of colors. Versa-Lok Retaining Wall Systems is the ideal solution for waterfront protection. Versa-Lok is the industry's original solid, pinned segmental retaining wall system and is unmatched in its design versatility. Walls, curves, corners and columns are all possible with Versa-Lok. The Vintage Weathered texture is a perfect match for historic structures. Bring your waterfront to life with a colorful Instant Aqua Park. You'll hear nothing but squeals of delight and laughter from your guests if you offer a collection of large water toys such as the Aqua Jump or Iceberg, along with a Saturn, Water Totter or the new Rock N Slide. With the variety of inflatable water toys available—in all sizes and budget ranges—there's no excuse for a drab waterfront. 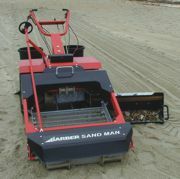 Beach Cleaning Equipment manufactured by H. Barber & Sons Inc. are the most widely used beach-cleaning machines in the U.S. domestic market and the international beach cleaning machine market. Pioneers in beach cleaning methods, Barber has manufactured beach cleaning equipment for more than 40 years. Barber beach cleaning machines are effective in removing beach pollution such as seaweed, fish, glass, syringes, plastic, cans, cigarettes, shells, stone, wood and virtually any unwanted debris. Most Dependable Fountains Inc.'s Dual Foot & Shower Tower offers twice the benefits of the Standard Model. Back-to-back foot and shower heads, double-capacity use and the Most Dependable Fountain reputation make any time playtime with the Model 575. The full spray does the job well, and the self-closing valve prevents water waste. The combination of vandal-resistance with low maintenance is always a priority with any Most Dependable Fountain, and the 575 is no exception. Choose one of 17 free standard colors or stainless steel.